These magnificent islands offer the ultimate in affordable luxury with their upmarket resorts or you can go for all out extravagance with your own beach hut for that romantic holiday or honeymoon. The high season is between December and May, however, if you want cheap family holidays in the summer months then, provided you don't mind the humidity, the Caribbean offers some excellent all inclusive deals, at a time that's traditionally the most expensive elsewhere. Antigua and Barbuda use the Eastern Caribbean dollar (EC$). US dollars are widely accepted. However, unless rates are posted in US dollars, as is the norm with accommodations, it usually works out better to use EC dollars. Nestled on an island of 365 beaches, one for each day of the year, the hotel will steal your heart with its magnificent gardens and tropical flowers, which line a path to the clearest of aquamarine seas. Set on breathtaking Dickenson Bay, the island's.. This hotel is located in Falmouth harbour. It is ideally situated for all the services of the English & Falmouth Harbours, directly on the main road, and offers all the amenities of the marina. It is only a few minutes' walk to historic Nelson's.. This all inclusive plantation-style complex is located in the village of Valley Church, on the west coast bay of the island of Antigua, just over a beautiful white sand beach of clear blue water, from where you can enjoy amazing sunsets. This retreat.. This elegant hotel is situated on a mesmerising cliff, on the western side of Antigua. Encapsulated between pristine sandy beaches and surrounded by the azure waters of the Caribbean sea, guests will feel as though they have found a hidden treasure in..
Property Location When you stay at Connie's Comfort Suites in St. John's, you'll be near the beach and close to St. John's Cathedral and Dickenson Bay Beach. This guesthouse is within close proximity of Recreation Ground and Antigua Government.. The resort is set in the village of Five Islands in the Parish of St. John's, on Deep Bay, a magnificent secluded 400 m stretch of white sandy beach in a sheltered cove adjacent to Fort Barrington. Restaurants, links to public transport and shops can.. The charming complex is set in landscaped tropical gardens, directly on the beautiful sandy Dickinson Bay beach. 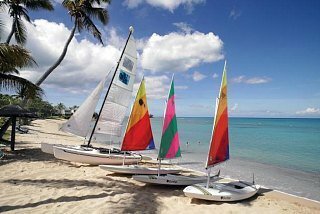 It is a lively resort offering a wide range of activities both on land and sea, which will appeal to couples and families alike. The hotel..
Nestled in 37 acres of landscaped tropical gardens, this resort is set around four virtually private bays with beautiful white sandy beaches. Accommodation ranges from garden bungalows to beach front club cottages, each with sea view and all rooms are..
Clustered around four white-sand beaches, including Antigua's only clothing-optional beach, this appealing resort is the perfect choice for an exciting, romantic escape. Set amidst landscaped tropical gardens, it appeals to couples and active travelers..